This cover. It invokes the theme of 2001 : A Space Odyssey (the music intro), doesn't it? Uh yeah...the book wasn't quite that epic. Boo. Even so, I was still kind of vibing on Gravity, in spite of there being a severe loss of interplanetary stuffs (traveling across worlds through the use of trees doesn't quite give off the same "what a massive galaxy to traverse" feel). I actually liked this book quite a bit. It was fun! My not-super-high rating is only reflective of me wishing for more sci-fi and not at all due to a lack of enjoyment! But first, a gripe. Why have most recent YA space and/or alien books been showcasing like paranormal romance instead of sci-fi? Even though I like The Lux series, it's always bothered me that the books read like pnr and not sci-fi. Why use aliens for your creatures if you're going to write pnr? Granted, I think that Gravity tried a lot harder than Lux did at incorporating sci-fi elements. There is something of a dystopia factor actually happening here. There was a definitive use of alternate/futuristic technology (moreso in the second half of the book), even though we aren't getting many of the technical explanations for how it all works. I'm honestly less concerned about the plausibility of it all than some other readers might be. What I mainly care about is that the author would choose to incorporate some ideas which make me feel like I'm reading the genre I had anticipated. I think we have a hit-and-miss thing happening here. 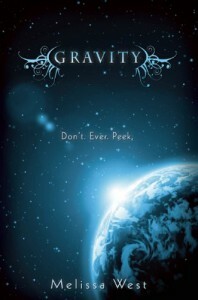 If I were to gauge the greatness of Gravity as a space or alien-themed sci-fi, the number would be low. Using the same gauge to determine dystopia or generalized sci-fi, this wouldn't be so bad (it's not like most current YA dystopia is well sketched-out these days anyway). What works : There's a big conflict revolving around which side (humans vs. ancients) is to be trusted. Natural instinct would put the reader siding with the humans initially (go home team! ), but soon enough, you start to wonder if staying loyal to the human race is the way to go. I like the potential for what is to come. The universe has been opened up and we might get a chance to see more of the alien opinion; we might even be able to sympathize with them. The entertainment factor is good. There are a variety of elements which keep the story moving at a decent pace - everything from romance to danger, which is leading up to a point where a showdown is bound to eventually happen. And for the record, I did end up liking the romance element, even though I didn't think I would at first because it was handled very pnr-obsessive at the start (although I liked the way that the author chose to throw the two lead characters together). It's that darn forbidden love angle which gets me every time and makes me start to root for the characters! Jackson's a cutie with a hidden soft side. What doesn't work : The book is split into two very distinct halves which aren't woven together as well as I'd like to see. The first half is very pnr-romancey, with a huge focus on the 'hot guy' who is hanging around Ari. Readers who were looking for sci-fi will probably put the book down before they get to the actual sci-fi part. Then, the second half starts wandering off into politics and intrigue, and the readers who were caught up in boy-meets-girl spin of the first half might end up feeling alienated (pun intended) by the second half. The verdict : While I would have preferred less pnr and more sci-fi, I liked the book for what it was, and that's what matters most. The romance is cute and the potential is there to showcase real conflict in the future. I'll definitely be reading on to see what happens next for Ari and Jackson.